Is used in a combination that has a combined or registered gross vehicle weight of more than 26,000 pounds or 11,797 kilograms. A recreational vehicle such as a motor home or a pickup with a camper is not considered a qualified motor vehicle when an individual uses it exclusively for personal pleasure. Vehicles used in connection with a business operation are not considered recreational. If you operate a diesel powered qualified motor vehicle whose interstate travel is restricted to Mexico and California you do not qualify for an IFTA license. However, you would qualify for the Interstate User Diesel Fuel Tax (DI) License. If you operate a qualified motor vehicle whose travel is restricted to California only, you are not required to hold an IFTA or DI license. In the case of other states the laws will be similar. Is there an alternative to IFTA registration? 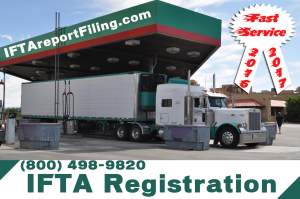 This is in case you do not want to go through the IFTA registration process. 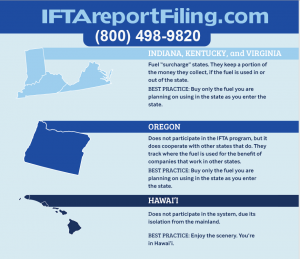 If you qualify for IFTA but do not choose to register, you must obtain fuel trip permits to travel into or through each member jurisdiction. You will be required to purchase a California Fuel Trip Permit every time you reenter California after traveling outside the state. This is also true for many other states. FTA also considers state surcharges, which complicate the fuel-buying strategy. Indiana, Kentucky, Michigan, Ohio, Vermont and Virginia have per-gallon surcharges; Idaho, New Mexico, Kentucky and New York have per-mile surcharges. While some owner-operators buy only enough fuel to get through surcharge states, this practice can backfire, depending on the actual cost of the fuel in each state. There may be times when buying more fuel in a surcharge state is more economical. Part of the challenge in smart fuel buying is keeping up with changing surcharges and taxes; Georgia, Massachusetts and New York revise their fuel taxes quarterly, and North Carolina revises its own semi-annually.